Hometown: Hamilton, New Jersey /Daytona Beach, Fl, U.S.
Died: April 7, 2011 in Operation Enduring Freedom. Sgt. Keith T. Buzinski, 26, of Daytona Beach, Fla., died April 7 in Logar province, Afghanistan of wounds suffered when enemy forces attacked his unit with small arms fire. 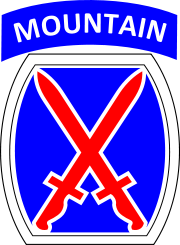 He was assigned to the 2nd Battalion, 30th Infantry Regiment, 4th Brigade Combat Team, 10th Mountain Division, Fort Drum, N.Y. Although only married a short time, Keith's main love in life was his wife, Andrea, and daughters, Mary and Taylor. He was predeased by his grandparents, Carl W. and Evelyn S. Storer. Keith is survived by his loving wife, Andrea Buzinski; his children, Mary and Taylor; his parents, Carol and Tom Buzinski; a sister, Lauren Buzinski; nephew, Joseph W. Foreman; Aunt Barbara Olszak and husband Robert, Aunt Phyllis K. Storer and fiance Mark Wharton, Uncle Frank M. Buzinski; grandfather, Frank J. Buzinski; and several cousins. Sgt. Keith T. Buzinski, 26, died while serving his country in Logar Province, Afghanistan, on April 7, 2011, due to small arms fire by insurgents. Keith was born June 2, 1984, in Trenton, NJ, the son of Carol and Tom Buzinski. Sgt. Buzinski was assigned to the 2nd Battalion, 30th Infantry Regiment, 4th Brigade Combat Team, 10th Mountain Division, Fort Polk, LA. Sgt. 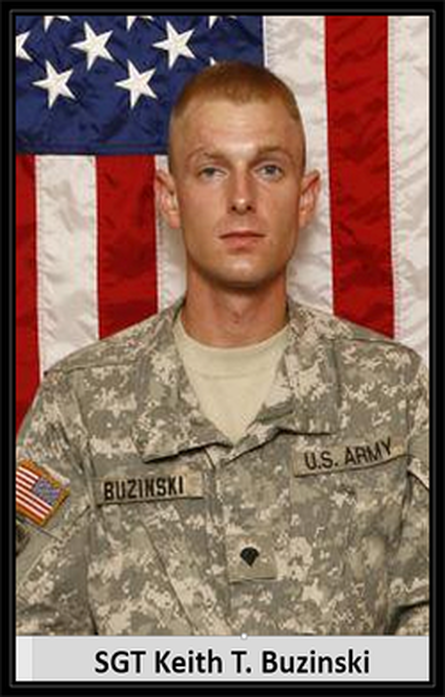 Buzinski previously served his country in Iraq for 15 months from September 2007 - November 2008, while assigned to the 101st Airborne Division located in Fort Campbell, KY. Sgt. Buzinski was said to have a fearless spirit and placed himself before others on the battlefield. He was a respected and devoted soldier. Just home on leave from March 13 to 18, 2011, he said he "was anxious to get back to his brothers in combat." His awards and commendations include the Bronze Star and Purple Heart, among others. Keith participated in various recreation sports while attending Hamilton Township schools. He participated in the Hamilton Recreation Soccer League as an 8- to 11-year-old, the Sunnybrae Little League, the Hamilton Football League and the Lawrence Flames Hockey Association. Keith also attended the Family Foundation School in Hancock, NY, where he learned many skills necessary for a successful life. Keith moved to Daytona Beach, FL, in his late teens to be near his sister, Lauren. While in Florida, Keith developed an interest in the Army and enlisted out of Daytona as an infantryman. Although only married a short time, Keith's main love in life were his wife, Andrea, and daughters, Mary and Taylor. Predeased by his grandparents, Carl W. and Evelyn S. Storer, Keith is survived by his loving wife, Andrea Buzinski; his children, Mary and Taylor; his parents, Carol and Tom Buzinski; a sister, Lauren Buzinski; nephew, Joseph W. Foreman; aunt, Barbara Olszak and husband Robert; aunt, Phyllis K. Storer and fiance, Mark Wharton; uncle, Frank M. Buzinski; grandfather, Frank J. Buzinski, and several cousins. Funeral services will be held on Tuesday, April 19, 2011, at 10:30 a.m. at the United Presbyterian Church, 12 Yardville-Hamilton Square Road in Yardville, with Rev. John Milne officiating. Relatives and friends are invited to call on Monday evening from 5 to 9 p.m. at the Buklad Yardville Memorial Chapel, 30 Yardville Allentown Road in Yardville. In lieu of flowers, the family requests donations be made for Keith's children, Mary-Margaret Kalbrunner and Taylor Morrison, to the following address, 15246B Kane St., Fort Polk, LA. 71459.